By David Ponce on 11/04/14 • Leave a comment! The time for turkey, cranberry sauce, mounds of buttery stuffing and more mashed potatoes than you can throw a potato at is just around the corner. Yes, my friends, Thanksgiving is upon us and with that, someone in your household will be given the desirable task of cooking the bird. 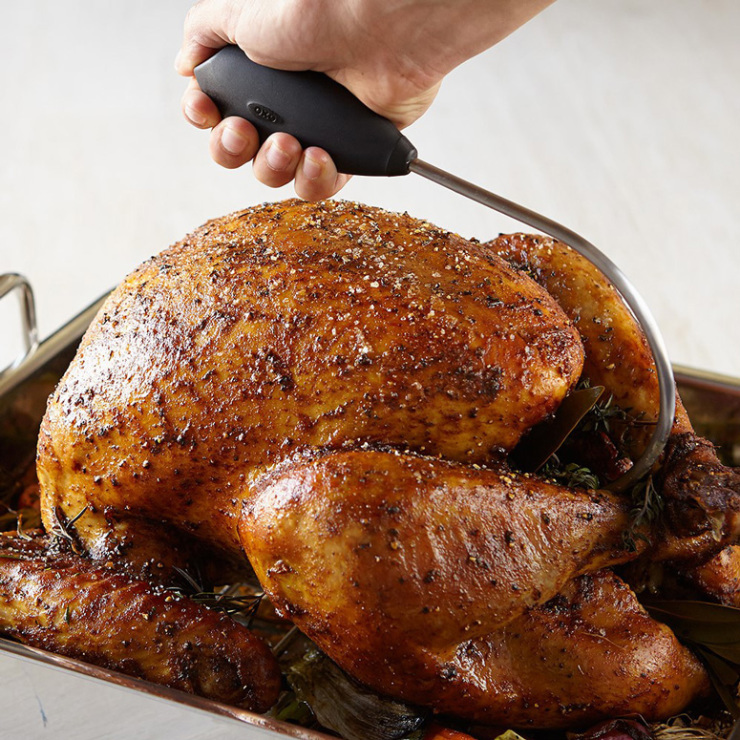 Make their life just a little easier by buying this OXO Good Grips Poultry Lifter. It’s a curved metal stick that goes right into the poor bird’s bum and lets you lift it without too much trouble. Considering some of them can reach 25lbs, this is one accessory that will be appreciated this November 27th. It’s $10. Need some ideas for Thanksgiving dinner? Then you might want to check out this Thanksgiving Menu Generator by Saveur. With a click of your mouse, you’ll be able to generate a full menu to make the holidays a little more special. They don’t just stick you with images or names of dishes, either. You can click on the displayed dish under the appropriate column to check out its recipe so you can get the ingredients and start cooking. In case you don’t want to leave the menu to chance, then you can access Saveur’s full gallery of twelve Thanksgiving menus instead. Happy holidays!